MARQUETTE — The Michigan Department of Natural Resources has stepped up its surveillance and information efforts in the wake of the Upper Peninsula’s first case of chronic wasting disease being confirmed Oct. 18 from Dickinson County’s Waucedah Township. A 4-year-old doe killed in September on a deer damage shooting permit tested positive for chronic wasting disease. The deer was shot on an agricultural farm about 4 miles from the Michigan-Wisconsin border, though there is no information available currently to determine whether the deer came from Wisconsin. The DNR has enhanced its CWD information efforts to help raise awareness about what the presence of the disease means for hunters and others, and to answer important questions posed by the public. A toolkit with printable brochures, ads, photos and presentations, along with maps, testing information and surveillance statistics, is available at michigan.gov/cwd. To date, there have been no reported cases of CWD infection in humans. However, the Centers for Disease Control and Prevention and the World Health Organization recommend the meat of infected animals should not be eaten. No plans are in place to ban or restrict deer baiting this year. A decision on supplemental winter feeding will be made once surveillance results are in. Since 2015, the DNR has been conducting active surveillance along the Michigan-Wisconsin border. This surveillance effort detected the CWD-positive deer. 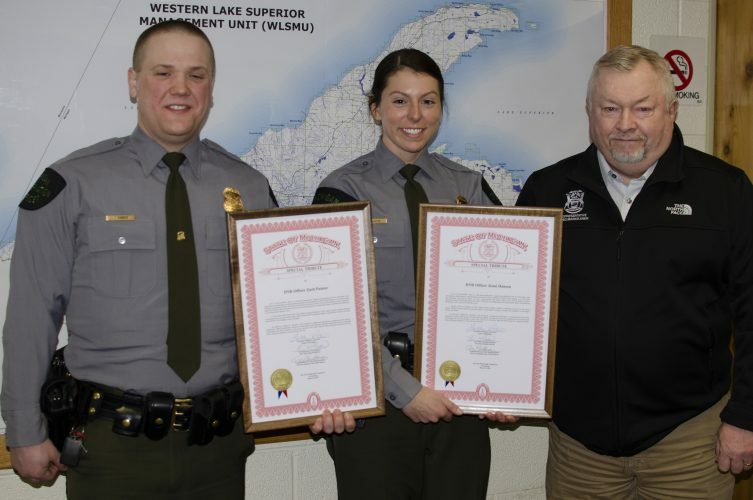 Deer collected through deer damage shooting permits, road kills and hunter submissions have been tested in the Michigan border counties of Gogebic, Iron, Dickinson and Menominee. Prior to the CWD-positive deer confirmation from Dickinson County, the DNR had set a goal of testing a minimum of 600 deer heads from these four border counties for 2018. Statewide, so far this year, the DNR has tested 37 percent of its 15,635-deer goal for 2018. There has been a total of 10 CWD-positive cases in Michigan this year, including one each from Dickinson, Ionia, Jackson and Kent counties, and six from Montcalm County. A roughly 10-mile-radius core surveillance area – encompassing 661 square miles – has been created, centered on Waucedah Township. Within this zone, the DNR is working to determine whether CWD exists in areas around the doe that tested positive. Baiting for deer has not been restricted in this area for 2018. Deer check is voluntary and encouraged. No in-state travel restrictions are currently in place. However, the DNR recommends limited carcass transport and proper disposal. The DNR hopes to collect a minimum of 600 deer heads for testing from this core surveillance area. Through this year’s previous border surveillance efforts, 358 of those heads already have been gathered and tested. A map showing chronic wasting disease surveillance areas in the Upper Peninsula. The boundary of the core area was set using several roadways. The zone is bordered by U.S. Highway 2, M-95 and the Menominee River on the west; M-69 from Randville to Bark River on the north and U.S. Highway 41/U.S. 2 and Menominee County Road G18 on the south. The Wisconsin Department of Natural Resources, given the recent CWD confirmation in Dickinson County, will focus its own CWD surveillance testing effort, opposite the U.P.’s core surveillance area, on the Wisconsin side of the Menominee River in Marinette County. Outside the core CWD surveillance area, the DNR has created an expanded surveillance area. Like the core area, this wider area is bounded by several geographic landmarks. The zone is bordered on the west by the Menominee River and M-95; on the north and east by U.S. Highway 41; and on the south by U.S. Highway 2 and Lake Michigan. As in the core area, baiting for deer has not been restricted in the expanded surveillance area for 2018. Deer check is voluntary. No in-state travel restrictions are currently in place. However, the DNR recommends limited carcass transport and proper disposal.